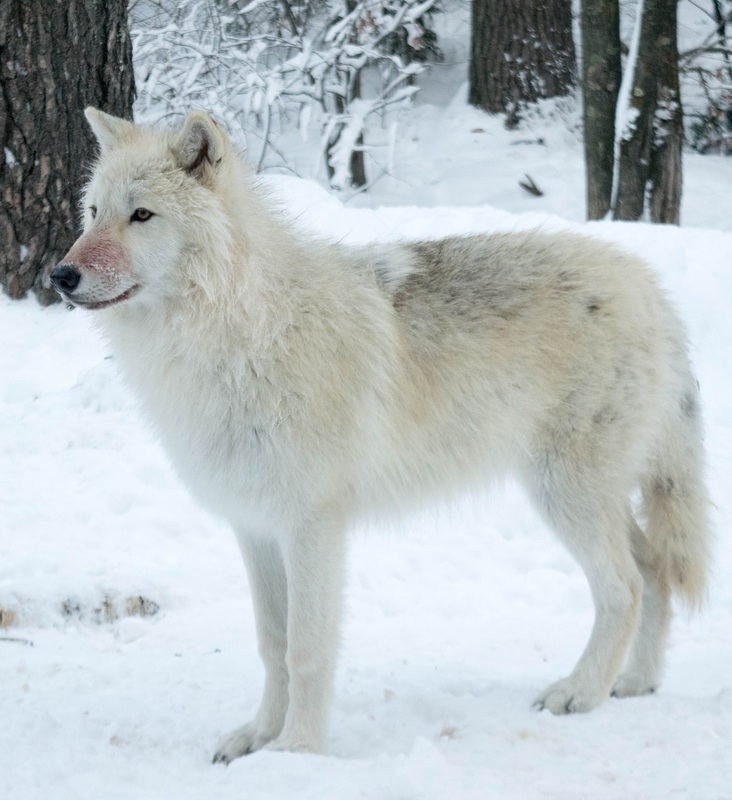 Grayson, along with his littermate Axel, are arctic subspecies of the gray wolf species (Canis lupus) born in captivity at a facility in Canada. Grayson may be distinguished by his darker coloration specifically in the mid-back or shoulder region. Grayson appears to have a broader skeletal structure. As young adults, it may be difficult to distinguish specific characteristics until they reach maturity at 18 – 24 months of age. 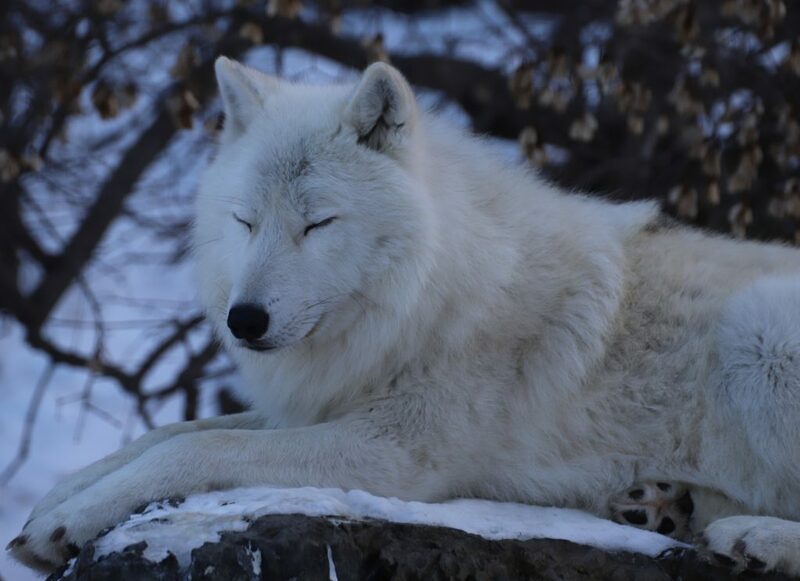 Arctic wolves’ native habitat is found in the northern regions of North America as well as along the eastern and northern shores of Greenland. There are several large islands that occupy this region including Ellsemere and Axel Hieberg islands. This region is typically snow covered for most of the year, but a mid-June to mid-August thaw supports enough plant material to feed the arctic wolf’s prey: musk-ox, caribou and arctic hares. For more information on our ambassador wolves, watch extended wolf videos on the International Wolf Center’s YouTube Channel or enjoy a close-up of wolf behavior on our Wolf Watch Cams. If you are interested in sponsoring Grayson, please click here. You may have noticed that the logs and youtube have been a little delayed. This week’s photo of Grayson is one challenges we face in getting quality video footage for publication. 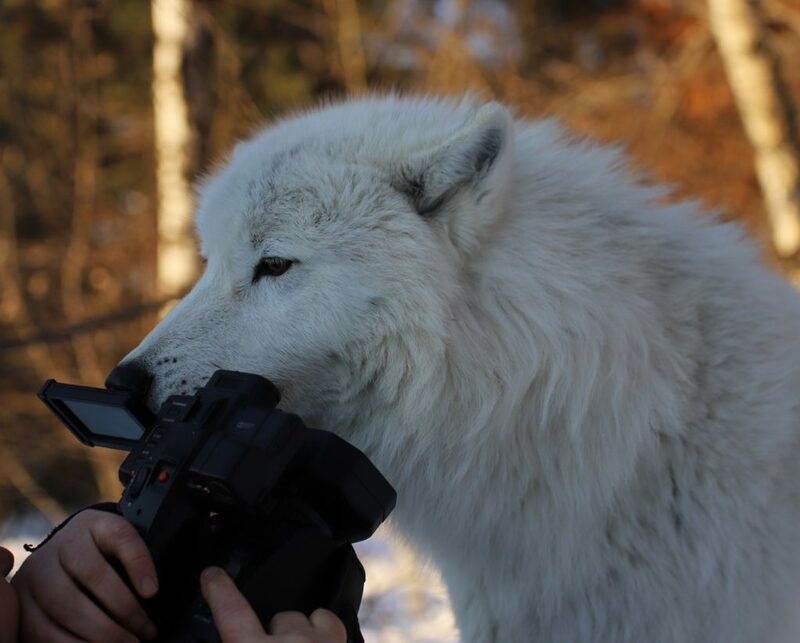 Wolves have a natural curiosity and bringing cameras into the enclosure means that wolves will often investigate. To be able to get footage, we usually require at least two people, one to distract and be an observer and one to look through the eye of the camera. Added to this challenge is subzero temperatures and precipitation and this winter has created some very short filming opportunities. Fortunately, we have a series of Birthday webinars coming up. If you miss our Youtube post, please join us for our webinars, where we have individual birthday webinars and more. Grayson and Axel’s birthday is May 2nd. Grayson seems to have the same pattern, losing weight, likely due to increased activity and some increased competition. Last winter he weighed 82 pounds in February 2018, but by October of 2018, he was back to 94 pounds. In addition to the weekly carcass on Saturday night’s What’s for Dinner Program, we feed some smaller food resources such as beaver, chicken or deer legs on Wednesdays and extra chicken or beef meals are offered to Grayson on a daily basis. The issue with Grayson is not about food availability, but it is about attitude and competition. He has always been more reserved and timid, so even if he may want the food, he is easily intimidated when other wolves display food defense. To reduce food competition, we require at least 2 if not 3 wolf care staff to distract the other wolves. The good thing is, we condition the wolves from the time they are pups to take meatballs and following the meatball tray as a form of distraction. Since we are scheduled to adopt pups again in 2020, we are brushing up on the adult behavioral traits that need conditioning with pups. Grayon- Do Wolves Really Sleep? With the exception of some of our retirees, it is rare to find a wolf that falls into a deep sleep accompanied by snoring. In most cases, the wolves have periods where they close their eyes, get some relief from the pack life, but even the slightest noise will see them spring into action or the the very least, an alert head and ear posture. In this week’s photo, Grayson is taking a moment on the rock, but the ears are pricked forward and slightly turned to capture surrounding sounds. The one exception to the rule of sound sleep might be after a major feeding. 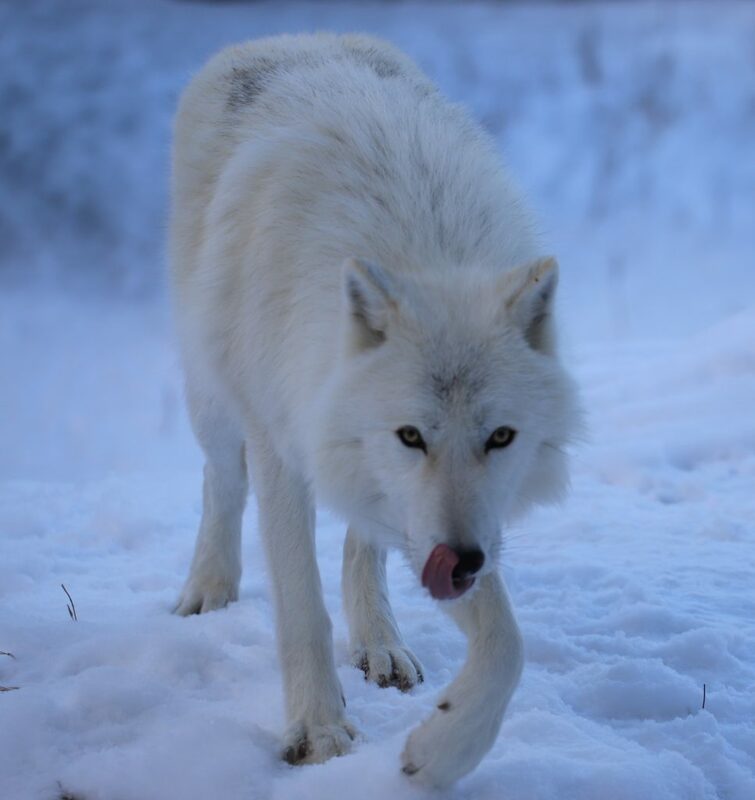 Wolves have the capability to eat a large quantity of meat in one sitting (research estimates ~20% of their body weight). There is no doubt that a full stomach can override the alert sensors and you may see minimal activity or interest in surroundings in either captive or wild settings. Grayson has a complexity to his behavior that can be a challenge to manage. 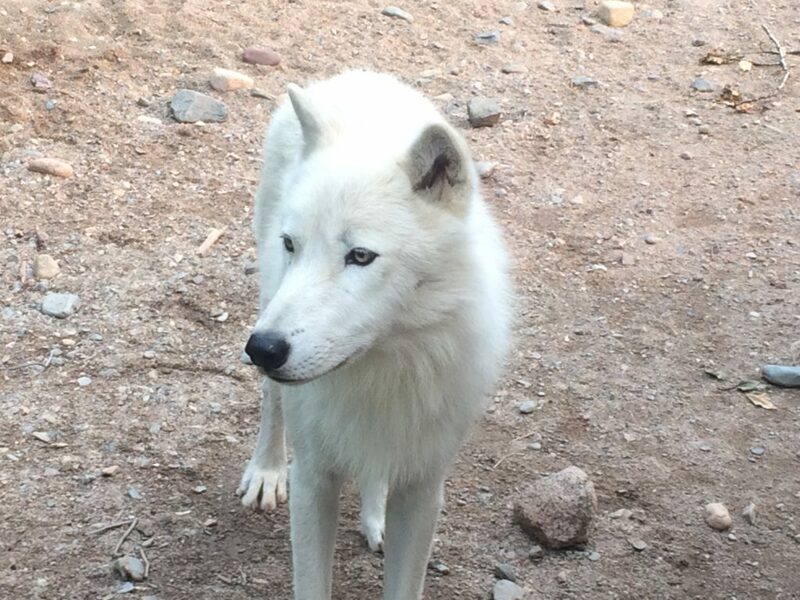 If there is a threat of a strange human or unknown activity around the enclosure, Grayson is the first (and sometimes only) pack member to bark howl in an alarm format. He is not testing for behavior like his littermate, Axel, but is waiting and watching for opportunities. The biggest conflict that he has is with Denali and is usually associated with food, but his more timid response means he is not as likely to defend food. Staff work on getting extra meals throughout the week to make sure Grayson gets the resources that he needs. Written by Brenda Loeb and Sheri Kreager participants in the Wolf Photography weekend in early October. Here is Grayson taking a break at the pond, he can usually be found in the presence of his brother Axel, doing laps through and around the enclosure. It is fun to watch him interact with the rest of the pack. He remains submissive to Denali and Boltz, it will be interesting to see if he steps up as the pack leader in the future. In the transition of Aidan into retirement, Grayson seems to have the most significant impact to his behavior. Even prior to retirement, Grayson would display some lone howls towards staff at the start of wolf care. He is a very vocal wolf, but lately, the howling seems to continue into the mid-morning. 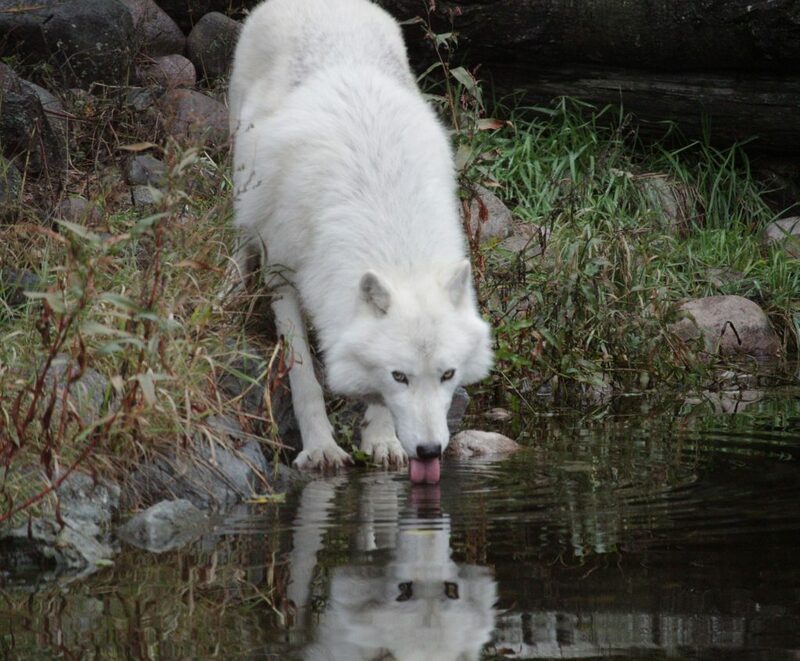 It is low throated in tone and no other wolf responds; Whatever he is communicating, the other wolves don’t seem stimulated to reply. The other behavioral changes include a bit more timid behavior about feeding, interactions with the rest of the pack and even his ability to compete for the daily meatball vitamins. Staff are spending more time with him and have added 4 supplemental feedings a week to boost Grayson’s body weight and provide more motivation to compete. Of course, staff need to find a distraction and even fifteen minutes of holding for Denali to accomplish this goal. It is week two of this action, and things are getting better. In our past experience, wolves that have the strongest bonds often have the most difficult time with change and loss of a that social companion.